Veneers are thin tooth-colored porcelain facings permanently cemented onto teeth. They can correct minor rotations in teeth, misaligned teeth, or problems with the size and shape of their teeth. Veneers are also a great cosmetic option for patients who have spotted teeth or teeth that won’t whiten. Not everyone is a candidate for veneers, see us for a consultation so we can determine the best way for you to have an ideal smile! An implant is the most ideal way to replace a missing tooth or missing teeth. At our office, an implant is a titanium post placed into the bone – this is NOT an uncomfortable procedure. After a few months of healing, a beautiful tooth colored crown is placed on the implant. 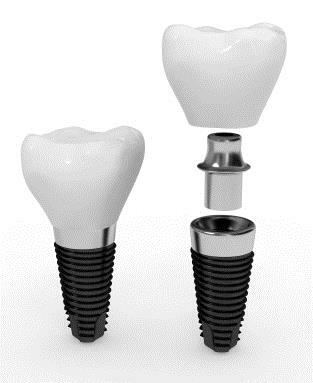 Implants can’t get a cavity, and don’t depend on the health of any other teeth in the mouth. They are an excellent esthetic option! A crown is a full coverage cap for a tooth that is permanently cemented in place. It can be used to repair and protect a tooth that is badly broken or decayed, or it can be used for cosmetic reasons to change the shape and color of a tooth. Crowns can be made of metal or tooth-colored porcelain. In addition to the option of an implant, a bridge is another way to replace a missing tooth. It is a series of crowns fused together – the crown in the middle takes the place of the missing tooth, and the crowns on each end are cemented to the tooth in front and behind the space made by the missing tooth. A bridge can replace one, two, three, or four missing teeth, depending on where it is in the mouth.